35 rary of non-fiction books dealing with the fantasy backgrounds of Witchcraft, Demonolatry, et al., appending a brief list of readable fiction on the same subject. 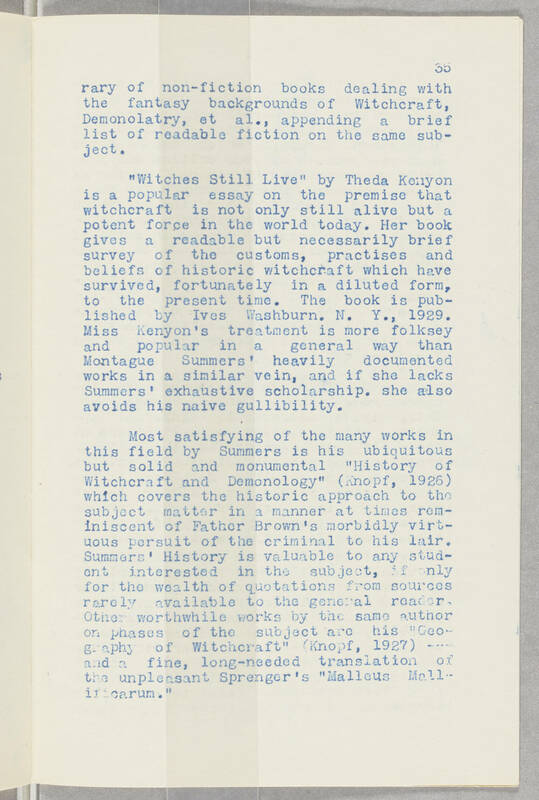 "Witches Still Live" by Theda Kenyon is a popular essay on the premise that witchcraft is not only still alive but a potent force in the world today. Her book gives a readable but necessarily brief survey of the customs, practises and beliefs of historic witchcraft which have survived, fortunately in a diluted form, to the present time. The book is published by Ives Washburn. N. Y., 1929. Miss Kenyon's treatment is more folksey and popular in a general way than Montague Summers' heavily documented works in a similar vein, and if she lacks Summers' exhaustive scholarship. she also avoids his naive gullibility. Most satisfying of the many works in this field by Summers is his ubiquitous but solid and monumental "History of Witchcraft and Demonology" (Knopf, 1926) which covers the historic approach to the subject matter in a manner that at times reminiscent of Father Brown's morbidly virtuous persuit of the criminal to his lair. Summer's History is valuable to any student interested in the subject, if only for the wealth of quotations from sources rarely available to the general reader. Other worthwhile works by the same author on phases of the subject are his "Geography of Witchcraft" (Knopf, 1927) --- and a fine, long-needed translation of the unpleasant Sprenger's "Malleus Mallificarum."